Biography of the companion of Imam 'Ali (a). It was dawn. As usual, Maytham went to the date-palm trunk. He splashed it with water. The good ground sent out a sweet smell. Maytham said two Raka'as. Then he put his back against the date-palm trunk. 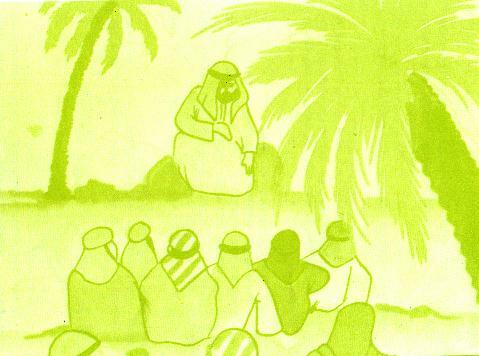 Maytham had visited the date palm for more than twenty years. It had not been a mere dry trunk. It had been a tall date palm before twenty years. Days, months, and years passed. Allah has created you for me. And He has created me for you. Maytham liked that date palm. He watered it when it was green. One day, he came to the date palm. He found it a dry trunk. He cut the top of the trunk. That tall date palm became a mere short trunk. Still Maytham went on visiting that dry trunk. What was the relationship between him and that date palm? Maytham was born at Nihrawan near Kufa. He belonged to Iran. A woman from Bani Asad bought him. One day, Imam Ali [a] bought and gave him his freedom. Maytham became free. He sold dates in Kufa Market. Maytham lived a simple life. Two things grew in his heart: faith in Islam and love for Imam Ali [a]. Imam Ali [a] taught him that Islam was the only way to freedom. Imam Ali [a] liked Maytham because he was a good man. The Imam went to Maytham's shop. He taught him about Islam. Allah Apostle [s] has told me that the Iranians call you Maytham. Allah and His Apostle are truthful. Since that day, Maytham had not left the Imam. Whoever goes to the desert at night will see the sky full of stars. His heart will be afraid of Allah. Imam Ali [a] went to the desert at night to say his prayers. He took a friend of his to that desert to teach him a lesson about Islam. 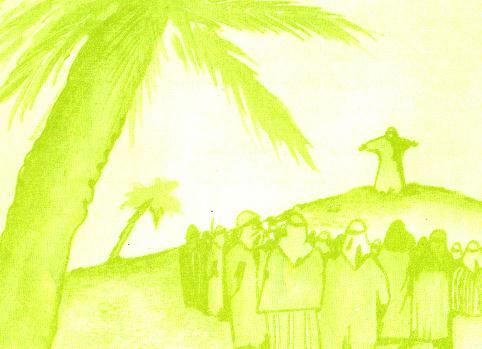 Sometimes, Imam Ali [a] took Maytham to the desert. He told him about future matters. The Imam had learnt future matters from our Master Muhammad [s]. Maytham listened to Imam Ali's words. The Imam said his prayers. Maytham said them behind him. He listened with awe to the Imam's prayers. Imam Ali [a] went to the market to meet Maytham al-Tammar. He sat and talked with him. Some people passed by them. They did not know the Imam. And some knew him. They were astonished to see the Imam sitting with a date seller. One day, Imam Ali [a] went to the market. He sat with Maytham. After a while, Maytham wanted to go to buy something. He asked the Imam's permission and went away. The Imam stayed behind to sell dates. In the meantime, a man came to buy some dates worth four dirhams. The man took the dates and went away. The owner of the dirhams will come back. The man bought the dates by false dirhams! Why will he come back? I don't want these dates! They are bitter! Why are they bitter? Because your dirhams are false! The man was full of astonishment. He took the dirhams and went away. Ask me whatever you want about the Qur'an explanation. I've learnt everything from Imam Ali [a]. So, bin Abbas sat before Maytham to learn lessons about the Qur'an explanation. I'll be your neighbour. Treat me kindly. Do you want to buy bin Masoud's house or bin al-Hakim's? Days and years passed. Unjust rulers succeeded each other over Kufa. They treated its people rudely. Ziyad bin Abeeh became a ruler over Kufa. He began killing Imam Ali's companions. He carried out Mu'awiyah orders. Mu'awiyah was full of spite. He ordered people to abuse Imam Ali [a]. Maytham, come with us to the Prince. Your Highness, the Prince, do you know this man? He's a liar! The supporter of a liar! The policeman meant that Maytham was one of Imam Ali's companions. Habeeb bin Mudhahir was a good companion. After our Master Muhammad's demise, Habeeb had a close relationship with Imam Ali [a]. I predict that a bald man with a big belly will sell melons at Dar al-Rizk. The man will be killed for the love of his Prophet's family. I know that a red man with two plaits would appear. The man will support the son of the daughter of his Prophet. The man will be beheaded. His head will be carried through the streets of Kufa. Then Bani Asad told Rasheed about Habeeb's and Maytham's predictions. May AIlah have mercy on Maytham. He's forgotten to say: The person who brings the head will be given an extra hundred dirhams. Rasheed is a liar; too! Days passed. In Muharram, 61 A.H., Bani Asad saw Habeeb's head. It was tied to a long spear. They saw Ibn Ziyad's policemen carrying the head and walking through the streets of Kufa. Mu'awiyah bin Abu Sufyan died. His son Yazeed succeeded him. Yazeed was a young man aged 30. He drank alcohol. He amused himself with the dogs and the monkeys. So, Imam Husayn [a] refused to pay Yazeed homage. Meanwhile, the Kufians were tired of Mu'awiyah's persecution. Thus, they sent Imam Husayn [a] many letters. In their letters, they asked the Imam to come to save them from the Umayyad persecution. The spies told Yazeed about the situation in Kufa. Yazeed had a spiteful Christian doctor called Sergon. He asked the advice of the doctor. Sergon advised him to appoint Ubaidullah bin Ziyad a ruler over Kufa. Many companions of Imam Ali [a] supported Imam Husayn [a]. Many Muslims supported him, too. Ubaidullah bin Ziyad arrived in Kufa, He began arresting and imprisoning Imam Husayn's supporters. Maytham, Mukhtar al-Thaqafy, Abdullah bin al-Harith were in the same prison. Imam Husayn [a] died a martyr for Islam. The prisoners felt pain for him. Be ready to meet Allah! After Imam Husayn's killing, Ubaidullah bin Ziyad will kill the Imam's supporters! Yes, he will kill us sooner or later! No, he won't kill you. My dear Imam Ali [a] has told me that you (Mukhtar) will get revenge of Imam Husayn's killers. And you will kick Ubaidullah's head with your foot. Maytham deeply believed in Allah. He was not afraid of the unjust. People were afraid of Ibn Ziyad. They shook with fear when they saw him. But Maytham did not pay attention to him. He knew that Ubaidullah's death was certain. He knew that the unjust would not stay alive forever. Mu'awiyah and his son Yazeed prevented people from loving Imam Ali [a]. The police arrested and killed the Imam's companions. The Umayyad will order you to disown me. Will you do that? I'll be patient! Death is little for Allah! You'll be with me in Paradise. I've heard that you're a companion of Ali's! By Allah, Imam Ali [a] has told me that you will kill me! He has told me that you will cut my hands, legs, and tongue! Your Imam is a liar! Maytham jeered at that foolish person (Ubaidullah). Ibn Ziyad ordered the police to tie Maytham to the date-palm trunk near the house of Amru bin Huraith. Besides, he ordered them to cut off his hands and legs. Maytham was tied to the date palm trunk. So, Amru bin Huraith ordered one of his daughters to sweep the ground around the date-palm trunk. He also ordered her to splash it with water. Disown Ali to save your soul! By Allah, this date palm has been created for me! And I've been created for it! Thus, people knew the secret of Maytham's visit to the date palm throughout the long years. People, if you want to hear some information about Ali bin Abi Talib, then come to me. The people crowded around Maytham. He began teaching them various kinds of knowledge. The spies told Ubaidullah bin Ziyad about Maytham's words. Amirul Mu'mineen has told me about that. The policeman cut off his Maytham's tongue. Another policeman stabbed him with a sword. Thus, this mujahid's life was put out like a candle! Maytham did a lot of good for people. The people loved him very much. They wanted to take Maytham's body to bury it. But the police strictly prevented them from approaching it. One night, seven dates-sellers came. They saw the policemen burning a fire. Two of them sawed the trunk. The seven dates-sellers carried Maytham's body outside Kufa. They buried it at a known place. Then they came back home. Six years passed. Mukhtar announced his revolution in Kufa. His army met Ubaidullah's on al-Khazir Riverbank. Ibrahim al-Ashtar could behead Ubaidullah bin Ziyad. Some fighters brought Mukhtar the head of Ubaidullah. He stood up and kicked Ubaidullah's head. He remembered Maytham's words in prison. Mukhtar, you'll get out of prison. You'll get revenge on Imam Husayn's killers. Days passed. Imam Husayn's killers perished. People have cursed them throughout history. Today, when a visitor leaves the Holy City of Najaf and goes to see the Kufa ruins, on the way he sees a beautiful dome. 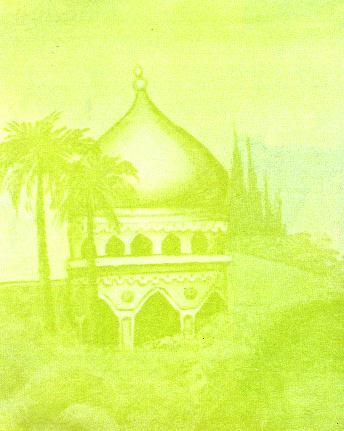 The dome decorates Maytham's shrine.